KARACHI: He left home to celebrate Eidul Fitr with five of his friends. Three of them never came back. Sixteen-year-old Omar Zaib was one of the 40 who drowned at Seaview on July 30. For his family, the pain is still fresh, even though the tragedy is no longer in the news. The police are initially unwilling to share the list of the names and ages of those who drowned. But a look at this list makes the tragedy hit the reader harder. Ayaz, 13, son of Sawali Khan. Amir, son of Umar Illahi, aged 15. Fourteen-year-old Ejaz Ahmed, son of Ali Zaman. A mere glance shows you who would flock to the turbulent seas even in the high tide of the monsoon season. They were all between 13 to 27 years old. They were all young men. They were residents of Sohrab Goth, Baldia Town, Orangi Town and Bhains Colony. While Karachi commissioner Shoaib Siddiqui says that most of the beach has now been reopened, the public trying to visit it says otherwise. 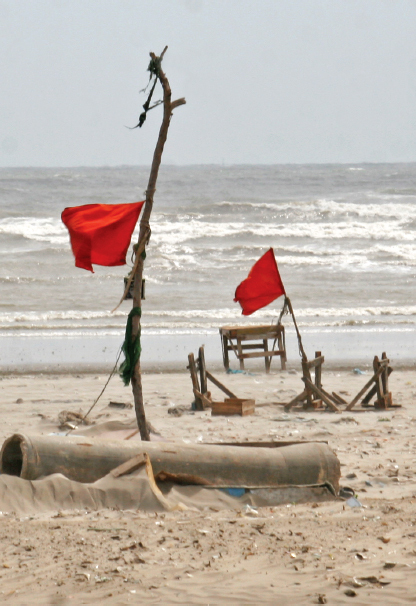 Anwar Bhutto, the duty officer at Darakhshan Police Station, confirms that Section 144 had been imposed for 90 days and the beach remains off-limits. Siddiqui, however, maintains that only the area behind Dolmen Mall is closed. “This is because it is reclaimed land and we have suspicions about dredging and depression in that area,” he says, adding that there should be evaluations about how construction near the beach might enhance risks. Omar’s family, and the families of the others who drowned, still await monetary compensation. Sindh Chief Minister Qaim Ali Shah promised them Rs0.2 million, while Malik Riaz pledged Rs1 million. “I cannot comment on why Riaz has not given the money he promised,” says Siddiqui. “As for the sum promised by the CM, the cases have been sent to the Relief Commissioner and hopefully the families will get the money soon.” He added that they should call 1299 to follow up on it. Published in The Express Tribune, September 5th, 2014. Posted in Karachi and tagged 40 drowned, Aman Foundation, Bahria Town, Clifton beach. Commissioner Karachi, lifeguards, Seaview, The express tribune. Bookmark the permalink.